I once had a white ’65 ES-355 with BB King’s autograph on it. It probably would have sold for more without it but the buyer was a BB King fan, so I left it. I get a lot of emails from folks buying and selling ES models and one of the most frequently encountered subjects is guitars that have been autographed. While this is not my market, I feel it’s worth writing a post about. The assumption by most sellers is that an autographed guitar is worth more than one that isn’t. I don’t entirely agree. Well, let me clarify. Right now there are no less than four Gibson “Lucille” models for sale of Reverb.com. One is $60,000, another is $15K, one $14K and one at $8000. The guitars, without the autographs, are nice guitars but they aren’t particularly old nor are they particularly collectible. I can pick up a 90’s or 2000’s Lucille for $2500 or so. So, do the sellers believe that the autograph is worth $5500 to over $50K? OK, the really expensive one comes with some tour swag but $60K seems like a really big number. So do all the rest of them. Let me tell you a fairly short story. 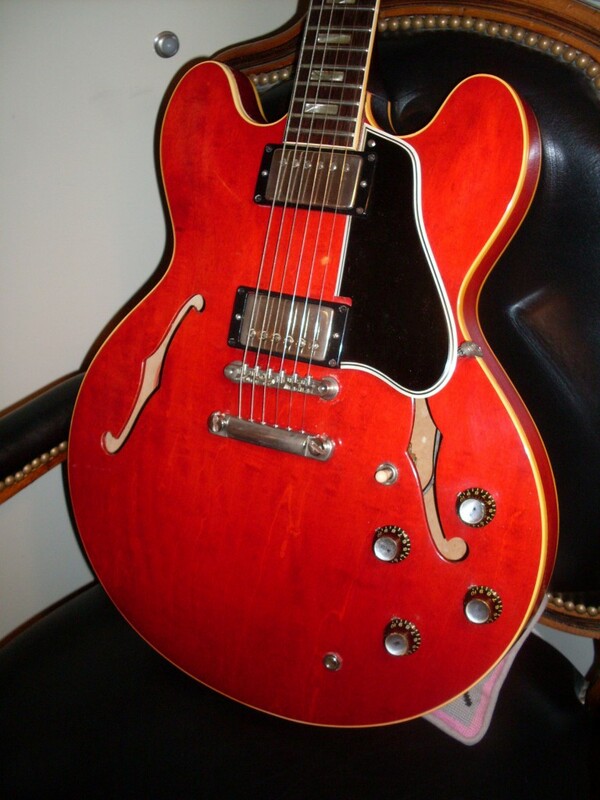 A few years ago, I was contacted by the widow of the owner of a pretty nice 1958 ES-335. I flew to Nashville to meet with her and discuss the value of her late husband’s guitar. We hadn’t finalized a price but we had established a range pending my inspection of the guitar. 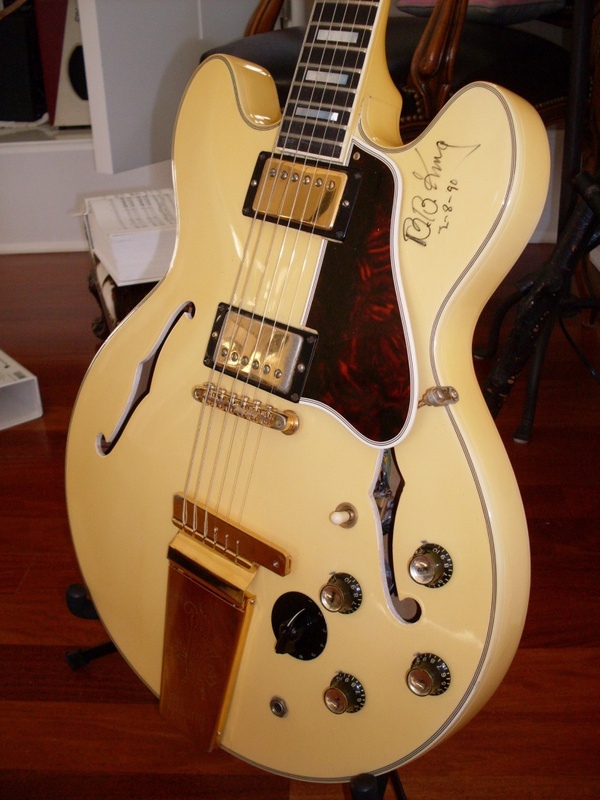 I ended up offering around $25000 for it and her reaction was “…but it’s autographed by BB King.” My clever rejoinder? “OK, $24000.” I explained to her that the first thing I would do when I got back home was to remove the autograph. 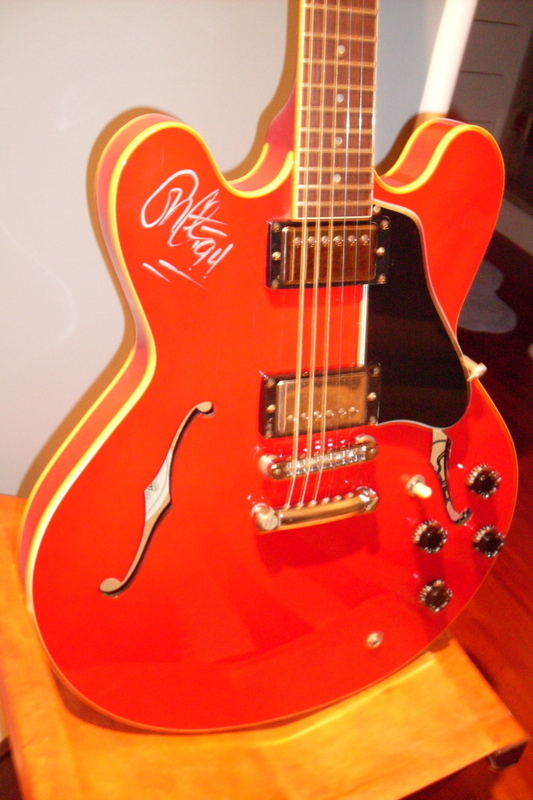 My point is that a collectible guitar is not made more collectible just because its autographed by someone famous. In addition to the great BB King, I have removed Eric Clapton’s autograph, Les Paul’s, various members of Kiss and quite a few others. If you must get your vintage guitar autographed, have them sign the pick guard-preferably on the back. Or bring along a new (cheap) guitar and have them autograph that. A lot of these guys sign thousands of guitars and the value of the autograph is very small. If you’ve got a Beatle or Elvis, then leave it alone. A Rolling Stone? I’d probably remove it from a vintage Gibson unless it was a Firebird VII autographed by Brian Jones. That would be worth something. OK, well how about if the guitar was owned by somebody famous? That’s a whole ‘nother ballgame if you’ve got good documentation. And he (or she) can’t just have played it once. It has to have really good provenance. An album cover photo is good provenance. A signed letter by the artist with a photo will probably do. A letter from a friend of the friend who got it from the famous player’s ex-wife’s cousin isn’t good enough. A photo of the famous player holding the guitar isn’t good enough either. I’ve had plenty of famous players in my shop and if a photo of them with one of my guitars was worth something, I’d be snapping photos all day. Be careful though. Provenance is pretty easy to fake. That’s why the album cover photo is great provenance. And make sure the guitar that’s in the provenance is the same guitar as you’re considering buying. Wood grain is pretty much like a fingerprint. If the grain doesn’t match, walk, no, run in the opposite direction. We all know what the Clapton guitars have sold for and the Dylan Strat and the Lennon J160. It’s some serious dough which is why I generally stay away from that market. The price of admission is high and the rate of fraud is up there as well. EC’s autograph on an ’84. I think I left this one on too. It didn’t affect the value at all. Huge neck, pat applied tuners, thin top, “T” FON…58, right? well maybe not. The serial number is 1960 in the A331xx range. What do I call it? Just when I make my big point about FON’s and serial numbers, a guitar comes along that makes me feel like I just shot myself in the foot. Generally, conflicting FON’s and serial numbers are on the cusp of the years they straddle. So, you might have a late 59 FON and an early 60 serial. I’d call that a 60. There are 58 FONs that show up in mid 59 which is strange. There’s a whole lot of them, in fact. My database shows that 1959 serial numbers A30247, A30248, A30251, A30268 and A30659 have “T” FON’s which means they were at least started in 1958. All show certain 58 only features like the thinner top. Some, but not all, have the shallow neck angle. Another 58 feature is patent applied Klusons rather than patent number. Interestingly, none of the 59’sn with 58 FON’s had them. That leads me to believe the bodies and necks were made in 58 but the guitars were assembled in 59 with 59 parts. None had shaved bridges or the low profile bridge (most of which have collapsed by now. 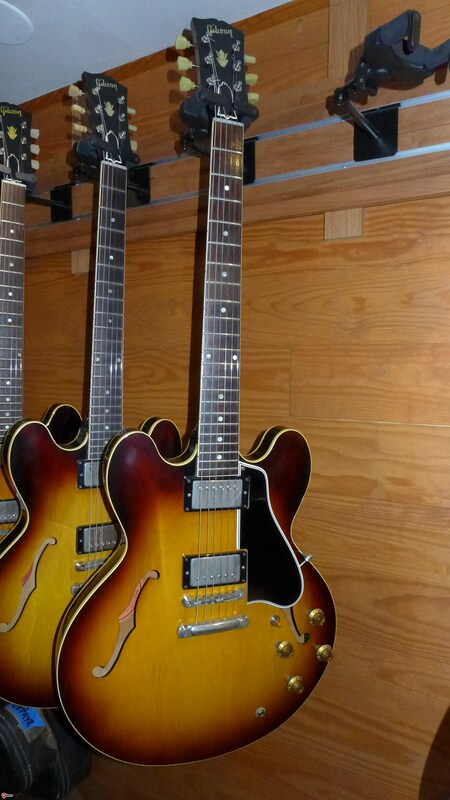 These are June 59 (and later) 335’s. Were these bodies somehow left over after Gibson made the changes? There were complaints about cracks in the tops and collapsing bridges, so maybe they put the unfinished 58 bodies aside until the complaints died down (or they got too busy) and decided to sell them anyway. That brings us to today’s subject guitar. The serial number is March 1960. That means the guitar sat for at least 15 months. The guitar has a relatively early (for a bound 335) 58 factory order number and shows all of the late 58 features including the pat. applied Kluson tuners, the shaved bridge and extremely shallow neck angle, thin top, “rolled” plastic truss cover (gone by mid 59). So, using the policy I laid out in my last post that says the serial number designates the year, it’s a 60. The problem is that everybody associates an early 60 dot neck with a smaller “transitional” neck profile. This one has the biggest neck I’ve ever measured on a 335-.94″ at the first fret and over 1″ at the 12th. Most 58’s are .88″ or so at the first fret. The biggest 59’s are usually .90-.93″. Calling it a 60 does the guitar an injustice but as a compromise, I’m calling it a 58/60 with a 58 FON and 58 features. This isn’t the first time I’ve come across a big gap in FON/serial number but its the first one that so clearly shows it’s FON heritage. I had a 62 block neck that somehow got an “R” FON designating a 60 build. But in that case, the guitar wouldn’t have been completed in 1960 as it had a block neck (started in 62) and patent number pickups (a completed 60 would always have PAFs). That one had a darker overspray at the endpin but it didn’t cover anything up. I just assumed it was covering some amateur paint work. maybe that’s why it didn’t ship when it was built. As I’ve said before, buying and selling vintage guitars requires a bit of amateur forensics and some imagination. You have to ask why something like that would occur and come up with a reasonable scenario beyond “uh, it must have been a special order…” Gibson seems to have been in a state of constant change throughout the period from 56-65 or so. That is perhaps why anomalies come up from time to time. Looks like a 62 but there is hidden weirdness going on. It has a 1960 Factory Order Number and has the thinner body of a dot neck. No one has a good answer for why this occurs.